1. Jim, Beastly, Michelle, Becca, Nathan, Shawn and family members are not eligible, because really, greed and gluttony are unbecoming in Hot Chicks and Smart Men. 2. I have delayed posting this until mid-day MST, to ensure everyone has an equal chance, even those who live west of me. 3. Shipment won't occur until I get around to it, because I do have other things to do this week, including performing the tasks for which I'm paid. May the fastest blogger win! Yay! I got first post! Anyone who wants this better speak up, and damn quick. Because, and I DO NOT exaggerate, this is the nectar of the Gods. My smart man would argue that strawberry preserves are the actual nectar, but he's not as smart as I am when it comes to rating berries. 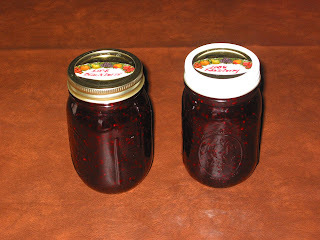 OH, and the strawberry jam arrived. Pictures and review coming real soon now. Cindi, do you need some more? Shawn, Boogie is, as they say, "ill equipped." Jeri, the first one's yours. Please send you snail-mail address to me at first name-dot-last name-upper case 2-comcast-dot-net. Since greed is unbecoming, I guess I should take this opportunity to admit that I have a jar and a half of blackberry left. Also one each of strawberry, blueberry and raspberry. So we're good. Can I claim a jar to be shipped to a friend? Because that would be fun! If that disqualifies, that's ok.
What you people do with my jam after I ship it is really none of my business. In some cases, I'm absolutely certain I don't want to know. Just sayin'. Tania, the second jar's yours. Please send your snail mail (or your friend's - I don't know why you'd want to ship it twice, espeically to/from Alaska) to first name dot last name upper-case-2 comcast dot net. Dammit, I'm always late to the party. I love blackberry, so next time it comes up, I call "shotgun." Anne, you can have some for your birthday. I'll bring it the next time we have lunch. Damn work getting in my way of responding. Oh! And any special requests for spa day? Amy, yours is already on its way. The advantages of being "family." But you can still buy me rolled taco's and guac! I'm gonna have to have a serious talk with my boss for distracting me with stuff like work. Does the man not know that Janiece's jam is at stake here? Y'all enjoy the blackberry jam! I can has jam sometyme soon 2. Kate and Carol Elaine, take heart. Eventually, all the regulars around here will be on the "ineligible" list, and you guys will win by default. You know, that thought HAD occurred to me. But then I remembered the type of luck I have when it comes to winning stuff and I realized that, as soon as it's down to to just me (because Kate would have won by then), then the entire world will have discovered you, you'll get readers that will rival or surpass Boing Boing in number and I'll never get the jam. Alternately, I can just set a reminder to check your blog first thing every morning, boss be damned! Shawn, hon, I'm old school. I'd forget to check my RSS feeds before I'd forget to check my blogs. Besides, I have a thing for looking at the designs of sites, thus no RSS for me. Just click, "NEXT" until there are no more unread blogs. Great way to kill a few spare moments between crises. RSS got me the jam. Go RSS!! !